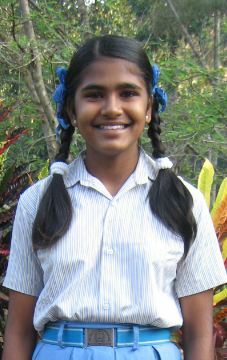 My name is Jayasree K. I am from Kerala the place known as Alappuzha. I am 14 years old now . I am studying VIII Standard. I have one brother who is studying in Vth Standard. When I was at the age of 8 years my father has passed away at that time I and my brother were alone. No one was there to take care of us. My mother was not keeping well. So my mother alone could not take care of us. She was not able to give us the education and she was not able to satisfy our stomach with food. So we came in Precious Children International Village. My mother works occasionally.